The first way to develop an innovation strategy is to (re)define where the firm wants to compete, what it defines as being part of its (new) “core business”. Specifically, this means finding new ways to explore – not just exploit – and reconfigure its business portfolio. The second way to develop an innovation strategy is to redefine how the firm wants its businesses to compete and which product/market positioning and value chain it wants them to build and sustain. A key element of an innovation strategy is to understand that first is not always best. A firm should assess and define how quickly it wants to enter new business areas and manage innovation accordingly. One high-risk/high-potential innovation strategy is to challenge generic strategies and define and implement a “strategic innovation,” a radical redefinition of where and how a firm wants to compete and shape its future. (Book) Foster, R., & Kaplan, S. (2011). Creative Destruction: Why Companies That Are Built to Last Underperform the Market–And How to Success fully Transform Them. Crown Business. (Book) Robertson, D., & Breen, B. (2013), Brick by brick: How LEGO rewrote the rules of innovation and conquered the global toy industry. Crown Business. (Book) Schulze, P. (2009). Balancing exploitation and exploration: Organizational antecedents and performance effects of innovation strategies. Springer. (Book) Verganti, R. (2017). Overcrowded: designing meaningful products in a world awash with ideas. MIT Press. (Book) Zook, C., & Allen, J. (2001), Profit from the Core. Boston, MA: Harvard Business School Press. (Article) Anthony, S. D., Eyring, M., & Gibson, L. (2006). 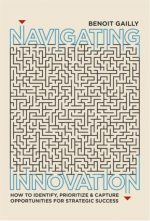 Mapping your innovation strategy. Harvard Business Review, 84(5), 104-13. (Article) Aspara, J., Lamberg, J. A., Laukia, A., & Tikkanen, H. (2013). Corporate business model transformation and inter-organizational cognition: The case of Nokia. Long Range Planning, 46(6), 459-474. (Article) Cheng, Y.T. & Van de Ven A.H. (1996). Learning the innovation journey: order out of chaos? Organization Science, 7(6), 593-614. (Article) Clausen, T. H., Korneliussen, T., & Madsen, E. L. (2013). Modes of innovation, resources and their influence on product innovation: Empirical evidence from R&D active firms in Norway. Technovation , 33 (6-7), 225-233. (Article) Eggers, J. P., & Kaplan, S. (2009). Cognition and renewal: Comparing CEO and organizational effects on incumbent adaptation to technical change. Organization Science, 20(2), 461-477. (Article) Furrer, O., Thomas, H., & Goussevskaia, A. (2008). ‘The structure and evolution of the strategic management field: a content analysis of 26 years of strategic management research’. International Journal of Management Reviews, 10, 1-23. (Article) Gassmann, O., Widenmayer, B., & Zeschky, M. (2012). Implementing radical innovation in the business: the role of transition modes in large firms. R&D Management, 42(2), 120-132. (Article) Greve, H. (2007). Exploration and Exploitation in Product Innovation. Industrial and Corporate Change, 16(5), 945-975. (Article) Gupta, A. K., Smith, K. G., & Shalley, C. E. (2006). The interplay between exploration and exploitation. Academy of Management Journal, 49(4), 693-706. (Article) Helfat, C. E., & Eisenhardt, K. M. (2004). Inter‐temporal economies of scope, organizational modularity, and the dynamics of diversification. Strategic Management Journal, 25(13), 1217-1232. (Article) He, Z. L., & Wong, P. K. (2004). Exploration vs. exploitation: An empirical test of the ambidexterity hypothesis. Organization Science, 15(4), 481-494. (Article) Jansen, J. J., Van Den Bosch, F. A., & Volberda, H. W. (2006). Exploratory innovation, exploitative innovation, and performance: Effects of organizational antecedents and environmental moderators. Management Science, 52(11), 1661-1674. (Article) Kaplan, S., & Orlikowski, W.J. (2013). Temporal work in strategy making. Organization Science, 24(4), 965-995. (Article) Lavie, D., Stettner, U., & Tushman, M.L. (2010). Exploration and Exploitation Within and Across Organizations. Academy of Management Annals, 4, 109-155. (Article) Levinthal, D. A. (2011). A behavioral approach to strategy—what’s the alternative?. Strategic Management Journal, 32(13), 1517-1523. (Article) Makri, M., & Scandura, T. A. (2010). Exploring the effects of creative CEO leadership on innovation in high-technology firms. The Leadership Quarterly, 21(1), 75-88. (Article) Mueller, V., Rosenbusch, N., & Bausch, A. (2013). Success patterns of exploratory and exploitative innovation: A meta-analysis of the influence of institutional factors. Journal of Management, 39(6), 1606-1636. (Article) Piao, M., & Zajac, E. J. (2016). How exploitation impedes and impels exploration: Theory and evidence. Strategic Management Journal, 37(7), 1431-1447. (Article) Prahalad, C. K. (2004). The blinders of dominant logic. Long range planning, 37(2), 171-179. (Article) Rosenkopf, L., & Nerkar, A. (2001). Beyond local search: boundary‐spanning, exploration, and impact in the optical disk industry. Strategic Management Journal, 22(4), 287-306. (Article) Rothaermel, F.T., & Deeds, D. (2004). Exploration and exploitation alliances in biotechnology: A system of new product development. Strategic Management Journal, 25 (3), 201-221. (Article) Rothaermel, F. T., & Alexandre, M. T. (2009). Ambidexterity in technology sourcing: The moderating role of absorptive capacity. Organization science, 20(4), 759-780. (Article) Stettner, U., & Lavie, D. (2014). Ambidexterity under scrutiny: Exploration and exploitation via internal organization, alliances, and acquisitions. Strategic management journal, 35(13), 1903-1929. (Article) Wan, W., Hoskisson, R., Short, J., & Yiu, D. (2011). ‘Resource-based theory and corporate diversification: accomplishments and opportunities’. Journal of Management, 37, 1335-1368. (Article) Zhou, K. Z., & Wu, F. (2010). Technological capability, strategic flexibility, and product innovation. Strategic Management Journal, 31(5), 547-561. (Article) Zook, C. (2007). 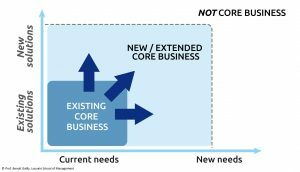 Finding your next core business. Harvard Business Review, 85(4), 66-75. (Book) Porter, Michael E. (1985). Competitive Advantage: Creating and Sustaining Superior Performance. New York. : Simon and Schuster..
(Book) Teixeira, T. S., & Piechota, G. (2019). Unlocking the Customer Value Chain: How Decoupling Drives Consumer Disruption. Broadway Business. (Article) Adner, R., & Kapoor, R. (2010). Value creation in innovation ecosystems: How the structure of technological interdependence affects firm performance in new technology generations. Strategic management journal, 31(3), 306-333. (Article) Chesbrough, H. & Rosenbloom, R. S. (2002). “The role of the business model in capturing value from innovation: evidence from Xerox Corporation’s technology spin-off companies“ Industrial and Corporate Change, 11(3), 529-555. (Article) Ireland, R.D., Covin, J.G., & Kuratko, D.F. (2009). Conceptualizing corporate entrepreneurship strategy. Entrepreneurship Theory and Practice, 33(1), 19-46. (Article) Ireland, R. D., & Webb, J. W. (2007). Strategic entrepreneurship: Creating competitive advantage through streams of innovation. Business horizons, 50(1), 49-59. (Article) (Article) Markides, C. C. (1999). A dynamic view of strategy. Sloan Management Review, 40(3), 55. (Article) Mintzberg, H. (1987). The strategy concept I: Five Ps for strategy. California Management Review, 30(1), 11-24. (Article) Ragatz, G. L., Handfield, R. B., & Petersen, K. J. (2002). Benefits associated with supplier integration into new product development under conditions of technology uncertainty. Journal of Business Research, 55(5), 389-400. (Article) Winterhalter, S., Zeschky, M. B., & Gassmann, O. (2016). Managing dual business models in emerging markets: An ambidexterity perspective. R&D Management, 46(3), 464-479. (Article) Zott, C., & Amit, R. (2008). 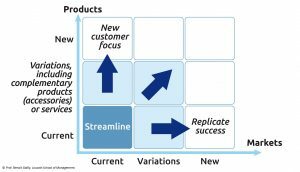 The fit between product market strategy and business model: implications for firm performance. Strategic Management Journal, 29(1), 1-26. (Book) Markides, C. C., & Geroski, P. A. (2004). Fast second: How smart companies bypass radical innovation to enter and dominate new markets (Vol. 325). John Wiley & Sons. (Article) Afuah, A. (2013). Are network effects really all about size? The role of structure and conduct. Strategic Management Journal, 34(3), 257-273. (Article) Anderson, P. & Tushman, M. (1990). Technological discontinuities and Dominant design. Administrative Science Quarterly, 35, 604-634. (Article) Arthur, W. B. (1989). Competing technologies, increasing returns, and lock-in by historical events. The Economic Journal, 99(394), 116-131. (Article) Christensen, C.M., & Rosenbloom, R.S. (1995). Explaining the attacker’s advantage: Technological paradigms, organizational dynamics, and the value network. Research Policy, 24(2), 233-257. (Article) Coeurderoy, R., & Durand, R. (2004). Leveraging the advantage of early entry: proprietary technologies versus cost leadership. Journal of Business Research, 57(6), 583-590. (Article) Covin, J. G., Slevin, D. P., & Heeley, M. B. (2000). Pioneers and followers: Competitive tactics, environment, and firm growth. Journal of Business Venturing, 15(2), 175-210. (Article) Enkel, E., & Mezger, F. (2013). Imitation processes and their application for business model innovation: An explorative study. International Journal of Innovation Management, 17(01), 1340005. (Article) Golder, P. N., & Tellis, G. J. (1993). 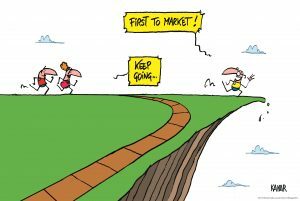 Pioneer advantage: Marketing logic or marketing legend?. Journal of Marketing Research, 30(2), 158-170. (Article) Henderson, R. (2006). The innovator’s dilemma as a problem of organizational competence. Journal of Product Innovation Management, 23(1), 5-11. (Article) Hill, C. W., & Rothaermel, F. T. (2003). The performance of incumbent firms in the face of radical technological innovation. Academy of Management Review, 28(2), 257-274. (Article) Lieberman M.B., & Montgomery D. B. (1988). First-Mover Advantages. Strategic Management Journal, Vol. 9, Special Issue: Strategy Content Research. (Summer, 1988), 41-58. (Article) Madsen, T., & Leiblein, M. (2015). What Factors Affect the Persistence of an Innovation Advantage? Journal of Management Studies, 52, 1098-1127. (Article) Markides, C., & Sosa, L. (2013). Pioneering and first mover advantages: the importance of business models. Long Range Planning, 46(4), 325-334. (Article) Marx, M., Gans, J. S., & Hsu, D. H. (2014). Dynamic commercialization strategies for disruptive technologies: Evidence from the speech recognition industry. Management Science, 60(12), 3103-3123. (Article) Ordanini, A., Rubera, G., & DeFillippi, R. (2008). ‘The many moods of inter-organizational imitation: a critical review’. International Journal of Management Reviews, 10, 375-398. (Article) Shenkar, O. (2010). Copycats: how smart companies use imitation to gain a strategic edge. Strategic Direction, 26(10), 3-5. (Article) Sheremata, W. A. (2004). Competing through innovation in network markets: Strategies for challengers. Academy of Management Review, 29(3), 359-377. (Article) Urban, G.L., Carter, T., Gaskin, S., & Mucha, Z. (1986). Market share rewards to pioneering brands: An empirical analysis and strategic implications. Management Science, 32(6), 645-659. (Article) Vidal, E., & Mitchell, W. (2013). When do first entrants become first survivors?. Long Range Planning, 46(4-5), 335-347. (Book) Markides, C. C. (2013). Game-changing strategies: How to create new market space in established industries by breaking the rules. John Wiley & Sons. (Article) Chan Kim, W., & Mauborgne, R. (2004). 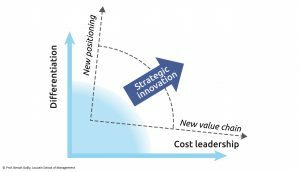 Value innovation: The strategic logic of high growth. Harvard Business Review, 82(7-8), 172-180. (Article) Choi, D., & Valikangas, L. (2001). Patterns of strategy innovation. European Management Journal, 19(4), 424-429. (Article) Govindarajan, V., & Trimble, C. (2004). Strategic innovation and the science of learning. MIT Sloan Management Review, 45(2), 67. (Article) Markides, C., & Charitou, C. D. (2004). Competing with dual business models: A contingency approach. The academy of Management executive, 18(3), 22-36.